Korchynsky, a former leader of an ultra-nationalist party and a devout Orthodox Christian, wants to create a Christian “Taliban” to reclaim eastern Ukraine as well as Crimea, which was annexed by Russia in 2014. He isn’t going to give up his quest lightly. The NIV translates the Hebrew word “qaddish” as “holy people,”1 and the NAS translates it as “saints.” The phrase “holy people” often times refers to the Jews (Deuteronomy 7:6, 14:2, Isaiah 63:18 NAS) and rarely does it, if ever, refer to Christians (possibly, Isaiah 62:11-12 NASB). The NIV in Daniel 7:21 adds the word “people” to the translation since the Hebrew word is plural. However, the Hebrew word “am,” translated as “people” is not in the original text.2 This means that the NAS translation is more faithful to the original text and that “saints,” interpreted (by me) as Christians, are a distinct group from “holy people,” i.e., Jews. This view is supported by Daniel 7:18 which prophesies that after the four empires have run their course, the earthly empire that survives are the “holy ones,” that is, the people of God through faith in Jesus Christ (which will include Christians and Jews who have come to Christ. Zechariah 12:10 NASB). 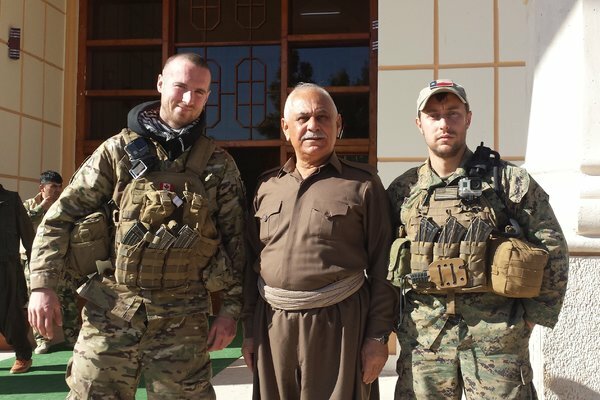 Patrick Maxwell, right, with Sheikh Jaafar Mustafa, center, the former Kurdish regional government minister responsible for the pesh merga, and Dillon Hillier of Canada, a fellow foreign volunteer. “We both thought it was important to help,” Mr. Hillier said. If Christian militias are forming in the Ukraine to combat Russian forces, how long will it be before the same takes place around the world? I was watching the news last week and there was a report of a former military person who served in Iraq who had observed ISIS retaking areas around Fallujah, a place U.S. forces had liberated. This man had been a part of the liberating forces. The report concluded with the man stating he was headed back to Iraq as a volunteer to fight ISIS for the sake of his young sons. He didn’t want them to have to fight ISIS one day, and if ISIS is not stopped now, his son might have to. A New York Times article repeats a similar story, but with different people, and for different reasons. Read more. I suppose that the most difficult thing to read in Bible prophecy is that the “saints are overpowered, worn down, or overcome.” They are never victorius — until the return of the Ancient of Days, our Lord Jesus Christ (Daniel 7:21, 25 NASB; Revelation 13:7-8 NASB; Daniel 7:18, 22 NASB). NextIran – Stealth Takeover of the Middle East is Underway. Daniel 7 & 8 Being Fulfilled? Democracy in Egypt – the Old Fashioned Way!